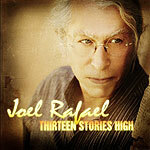 CD review: "Thirteen Stories High"
Valley Center's Joel Rafael had been living and playing in the area for more than a decade before most local music fans caught on to his warm, welcoming brand of acoustic folk. In 1994, he released his debut album, "The Joel Rafael Band," which took off on the the new-new AAA radio format  including Carlsbad's (now defunct) KKOS. Suddenly, Rafael  who'd been playing and singing his songs in area coffee houses for years  was a household name in much of the country. Two more well-regarded CDs followed in '96 and 2000. After playing in a Woody Guthrie festival, Rafael issued two Guthried tributes  "Woodeye: Songs of Woody Guthrie" in 2003 and "Woodyboye: Songs Of Woody Guthrie And Tales Worth Telling, Vol. 2" in 2005. Now, with "Thirteen Stories High," Rafael has issued his first collection of his own songs in eight years. And it's as solid a collection of new songs as he's yet recorded. Thirteen tracks, all anchored by his tight backing band and his warm, conversational singing voice. The album opens with "This Is My Country," a protest song that features backing vocals from David Crosby and Graham Nash and all the lyrical subtlety of a 2x4 up side the head. Sans the superstar harmony vocals, "Rich Man's War" continues the protest vein on the third track. Both songs are so beautiful, though, that even if you don't share his politicial sentiments, surely you can appreciate his artistry and passion. And the love song they sandwich is perhaps the most gorgeous tune yet to come from his pen. "Ball and Chain" is gentle and tender yet fully masculine  think Clint Eastwood in "The Bridges of Madison County." And "I Ought to Know" is a fun, rollicking folk-rock nod at the cultural knowledge modern society has traded in for sitcoms and talk radio. The other songs are mostly slice-of-life looks at the struggles of ordinary folks: the kind of songs that Tom Russell, Dave Alvin and Guy Clark have turned out for the past few decades. With Rafael's relaxed delivery and his band's stellar musicianship, lesser songs would have been a delight to listen to. The fact that each track here is of a caliber to call on comparisons to songwriting giants like Russell, Alvin and Clark makes this album one of the best folk records heard in some time.